PMOR and Tap-a-PM wrote:Managing repetitive work, process management, was the norm for centuries. Agriculture, manufacturing, retail, transportation, and other endeavors remained the same for years or decades. Those days are past. The world is moving much faster and all processes must change often. Changing a process is a project and it demands project management skills. No longer can a business manager, nurse, teacher, or any other worker assume that he or she can learn a routine and then repeat it for years. 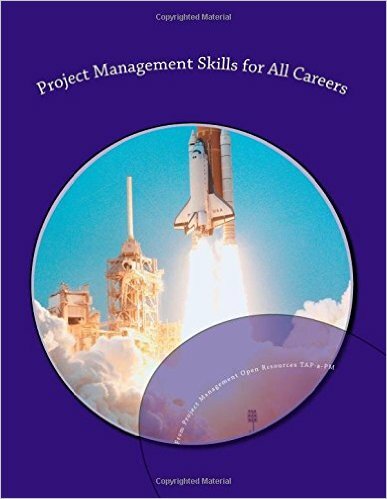 - To provide students with project management skills they can apply in any chosen profession. - To provide instructors with an open-licensed textbook they can freely copy, move into a learning management system; and modify to suit their teaching style, student demographics, available teaching time, and more. Project Management Open Resources (PMOR) is an organization dedicated to creating, publicizing, and distributing open-licensed project management information. PMOR‘s community includes over 60 members, many with extensive project management experience and certifications. Tap-a-PM is a cooperative association of project and program managers founded in February of 2008 that acts as a source of accomplished program and project managers with full project life-cycle skills across a set of disciplines and industries. The association supports its members with a wealth of domain expertise and connections into the wider project and program management community.